On the nuclear scene, the New Nuclear Arms Race remains the biggest threat in 2019. Meanwhile, as the nuclear industry fails economically, the mainstream media continues to pour out articles about “new nukes” – Small and Medium Nuclear Reactors (SMRs), Molten salt reactors. – articles that read like straight handouts from the nuclear lobby.onal Park to get $216 million boost. Space travel? The human body is not compatible with ionising radiation. its members decide at their meeting this week to scrap plans for a new nuclear power station at Wylfa on the North Wales island of Anglesey? Hitachi has invested more than £840m in the project over the past six years. The technology has passed all the tests set by the UK’s nuclear regulator. But the company has been unable to get the government to put in place the clear and credible financial structure necessary to underpin the investment. past few months and the company’s purchase of ABB’s power grid business at the end of last year gives it a range of investment choices. Given Whitehall’s chronic indecision, the company is ready to use its capital elsewhere. Hitachi’s withdrawal would mark the collapse of the energy policy adopted in 2013 by the UK’s coalition government. Facing what were believed to be ever-rising energy prices the policy plumped for new nuclear, promising that 35 gigawatts of new capacity would be on stream by the mid 2030s – more than replacing the first generation of nuclear plants, which would by then have reached the end of their useful lives. Because the price of gas seemed doomed to keep rising, new nuclear would come to look highly competitive over time as well as reducing dependence on imports. Since then much has changed, and the assumptions which underpinned the old policy now look laughably wrong. The costs of all forms of energy (apart from nuclear) have fallen dramatically and there is no shortage of supply. Electricity demand is down thanks to efficiency gains and new technology. The contract for the first new nuclear station being built at Hinkley Point in Somerset, which enjoys a guaranteed index-linked price for 35 years from the moment the plant is commissioned, looks exorbitant. The demise of Wylfa forces the need for a comprehensive review of energy policy. possibilities each year. But those options will never be taken up unless the old outdated policy is scrapped and a more realistic approach put in place. The shutdown of Oyster Creek Nuclear Station- is it best to hand the waste management to Holtec? After the Shutdown: Oyster Creek Nuclear Generating Station Oyster Creek is done producing nuclear energy. Now comes the hard part: cleaning up five decades of radioactive waste. New Jersey Monthly, By Ian T. Shearn | | January 14, 2019 “……..At noon this past September 17, operators shut down the Oyster Creek turbine. Three minutes later, two “scram” buttons were simultaneously pushed, inserting 122 control rods into the reactor core and aborting the nuclear reaction inside the vessel. After nearly a half-century of operation, the nation’s oldest active nuclear power plant went offline for good. “Is this the company we want to be handling a $1 billion trust fund?” asks Gunter……..
Tomgram: Nick Turse, One Down, Who Knows How Many to Go?, Tom Dispatch by Nick Turse , January 8, 2019. Follow TomDispatch on Twitter @TomDispatch. “Undocumented bases are immune to oversight by the public and often even Congress,” Vine explains. “Bases are a physical manifestation of U.S. foreign and military policy, so off-the-books bases mean the military and executive branch are deciding such policy without public debate, frequently spending hundreds of millions or billions of dollars and potentially getting the U.S. involved in wars and conflicts about which most of the country knows nothing.”Where Are They? One prime example is the constellation of outposts that the U.S. has built across Africa. The official BSR inventory lists only a handful of sites there — on Ascension Island as well as in Djibouti, Egypt, and Kenya. In reality, though, there are many more outposts in many more African countries………..
Africa is hardly the only place where the Pentagon’s official list doesn’t match up well with reality. 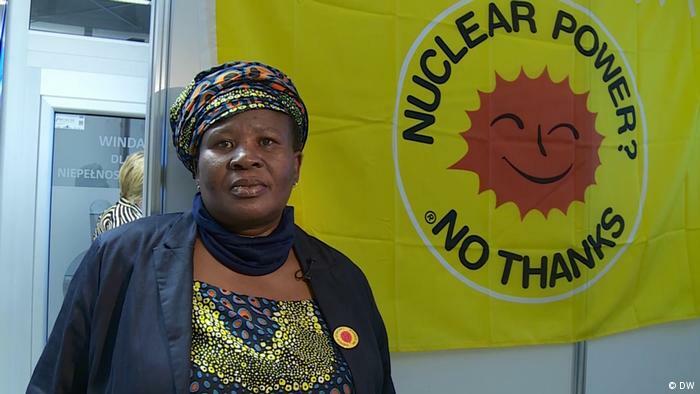 ……..
Prize-winning South African activist Makoma Lekalakala’s successful legal battle to stop a secret nuclear power deal in her homeland won her international acclaim. She tells DW about defending the environment in court. DW: What have you been campaigning for? JANUARY 14, 2019, SPECIAL SERIES – SOUTHERN (DIS)COMFORT Editor’s Note: This is the 24th installment of “Southern (Dis)Comfort,” a series from War on the Rocks and the Stimson Center. The series seeks to unpack the dynamics of intensifying competition — military, economic, diplomatic — in Southern Asia, principally between China, India, Pakistan, and the United States. Catch up on the rest of the series. After INS Arihant, India’s first ballistic missile submarine (SSBN), finished its maiden deterrent patrol in November 2018, Prime Minister Narendra Modi emphatically declared India’s nuclear triad complete. Arihant’s operationalization has catapulted India into a select group of states with an underwater nuclear launch capability. It has also raised alarm over the safety and security of India’s nuclear arsenal because a sea-based deterrent may entail a ready-to-use arsenal and less restrictive command and control procedures, increasing probability of their accidental use. For Pakistan, India’s nuclear force modernization endangers the balance of strategic forces in the region and could intensify the nuclear arms race on the subcontinent………. Ultimately, the risk is that India will fail to achieve its aim of deterring China while unintentionally provoking its smaller rival…………….. The nuclear competition between China, India, and Pakistan is a classic case of a triangular security dilemma. As India pursues deterrence stability vis-à-vis one adversary, it makes another adversary feel increasingly vulnerable……..
First step to a solution on nuclear waste: End Yucca Mountain https://lasvegassun.com/news/2019/jan/14/first-step-to-a-solution-on-nuclear-waste-end-yucc/ By Judy Treichel, Jan. 14, 2019 There is an interesting phenomenon at the Department of Energy when it comes to the disposal of high-level nuclear waste. SMOL: Remembering Canada’s dangerous foray into nuclear weapons BY ROBERT SMOL Toronto Sun, 13 Jan 19, During the 1960s and ’70s, the prosperous bedroom community north of Montreal where I lived a carefree childhood had a dirty little secret. One that, thankfully, never came to haunt me. Fifty-five years ago — on Dec. 31, 1963 — the Liberal government of Lester Pearson formally acquired American-controlled nuclear weapons for use by the Canadian military. Among the RCAF Squadrons stood up specifically for this purpose was RCAF 447 Surface to Air (SAM) Squadron at LaMacaza near Mont Tremblant, a mere hour and change drive from my childhood home. This and its sister squadron, 446 SAM at North Bay, Ont., combined housed 56 Canadian BOMARC missiles — each carrying a 10-kiloton nuclear warhead maintained, armed and jealously guarded by in-house American servicemen. Their mission, in layman terms, was to get the BOMARC warhead to detonate in the air close enough to the incoming Soviet bombers so as to destroy, avert or at least delay their further progress on their targets. But the Canadian and American officers and NCOs who guarded, serviced and stood by ready to launch these U.S manufactured and nuclear-tipped Canadian BOMARCS were by no means alone. RCAF and Army bases, across Canada and into Europe, served as multi-faceted purveyors of U.S nuclear weapons………..
Maybe you have heard the story of how India got the Bomb with Canada’s inadvertent help. We sold India a nuclear reactor called CIRUS in 1954 on an explicit promise that the facility would only be used for peaceful purposes. When India astonished the world with its first nuke test in May 1974, having upgraded the fuel output from CIRUS, it duly announced that it had successfully created a Peaceful Nuclear Explosive. The permanent consequence was, for better or worse, a nuclear-armed Subcontinent.This is old news to enthusiasts of Cold War history. Here’s the new news: it almost happened twice. Canadian technology was almost used by another country to break into the nuclear club.